Magtec, the UK's largest supplier of electric vehicle drive systems, is creating a number of highly skilled new jobs to help the business take advantage of growth opportunities in the high-tech global industry. In 2016 the firm relocated its Sheffield truck conversion facility to Templeborough in Rotherham, taking over a 16,000 sq ft unit at the same time as taking on a second manufacturing site in Sheffield of 27,000 sq ft. Magtec currently employs 71 people at its factories in Sheffield and Rotherham, adding 22 in the last financial year. Marcus Jenkins, founder and managing director of Magtec, said: "Our innovative and elegant engineering is attracting interest from all over the world. "We want ambitious and energetic people to join our fast-growing business and help us make a global impact as a UK pioneer in electric vehicle drive systems." This year, Magtec has brought in young talent including apprentices recruited via Sheffield City College, engineering graduates recruited via the Sheffield City Region's Rise programme, and teenage work experience placements welcomed from local schools. New apprentice Alex Gorringe, 26, said: "I used to work as a butcher in Grimsby, but I always wanted to do something in engineering and now I am a mechanical assembly apprentice. "It's very hands-on at Magtec. I am paired with a senior colleague who is walking me through everything from start to finish. 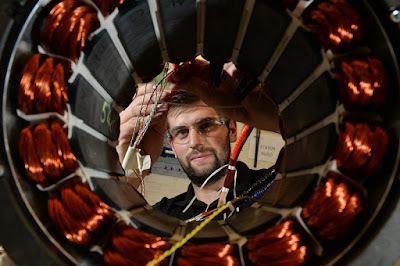 "I am gaining lots of practical experience about how electric motors work. In the future, I hope to be able to use this experience in the design of our products. "Working in electric vehicle drive systems is challenging, interesting and fun and I am surrounded by enthusiasts who want to make a difference in a sector which has a very bright future." Sinead O'Neill HR manager at Magtec, added: "We have ambitious growth plans. We have the world knocking on our door and we need to recruit. "I am really excited about making Magtec a fantastic place to work. This company is going to change the world. What we do is amazing. We want to become an employer of choice in the North of England."